Hawkeye Series knives are the most used knives in all of ophthalmic surgery. The Hawkeye Series provides great value and sharpness for paracentesis incisions. Every Accutome blade is manufactured to the highest quality and specifications inside of our Accutome facility. These lancet blades measure 1.0mm in width and come in various styles with either a straight or angled holder. Handle is aluminum with J-locking mechanism. 0.7mm truncated lancet blade with straight holder. 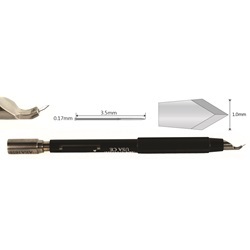 0.7mm trifacet truncated lancet blade with straight holder. 1.0mm truncated lancet blade with straight holder. 1.0mm truncated lancet blade with angled holder. 1.0mm lancet blade with straight holder. 1.0mm lancet blade with angled holder.